‘Game Of Thrones’ Star Sansa Stark AKA Sophie Turner Is Engaged In Real Life With Joe Jonas! After Kit Harington AKA Jon Snow, who recently got engaged to Rose Leslie AKA Ygritte, another Game of Thrones star Sansa Stark AKA Sophie Turner announces her engagement to beau Joe Jonas. Yes, that’s right! Sophie and her fiancé Joe Jonas had been dating for a year and decided to take the next step by making their relationship official, causing an excitement among us. “I found it easier to date someone who understands the industry or is in that world. You realize that you’re not going to see each other all the time,” Turner had said in an interview to InStyle earlier. Priyanka Chopra-Nick Jonas Go On A Double Date With Sophie Turner And Joe Jonas! Their pictures have received millions of likes with fans showering congratulations messages. 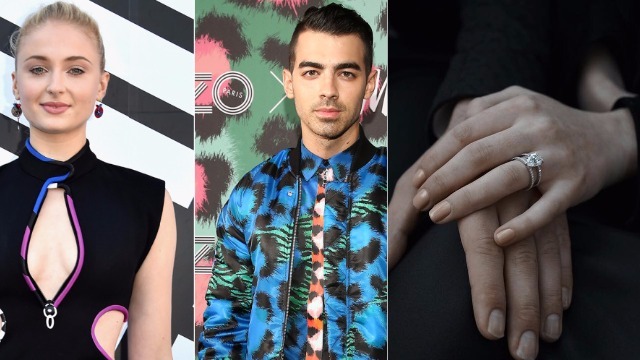 Congratulations, Sophie Turner and Joe Jonas! Previous : Bigg Boss 11: Salman Khan Apologizes to Zubair Khan, But In The Most Satarical Way!